IVA - Task 5 The body's energy systems can be improved and adapted. Training can bring about physiological changes to the body which enable us to improve the energy systems therefore the systems can create more ATP for movement. The adaptations which occur affect the systems in different ways depending upon what training is being done. The factors which affect the type of adaptations which occur are the four main principles of training; specificity, progression, overload and reversibility. Specificity This principle stats that you're training must be specific to what you are wanting to improve. For example if you want to improve you aerobic system you should do aerobic training. Your training should be relevant to what you want to work and improve. Overload Overload training is 'an exercise overload specific to the activity must be applied to enhance physiological improvement and bring about a training response' (McArdle et al, 1996). This principle is based on the idea that you exercise at a higher intensity than you normally would. Overload is doing more than the amount your body is used to. Progression This is closely related to overload. When exercising you increase the overload over a time. During a training program, training three times a week your improvement will slow after about four weeks therefore your training must become harder. To aid you in the training progress you need to increase either the frequency of your session, the intensity of your session or the amount of time you do the session for. Increasing any of these three will be progressive for your training. Increasing just one of the three will be making you train harder you needn't increase all of them. ...read more. Increase in Oxygen intake More oxygen is available to be used by the body during exercise. Effect on performance: Helps to delay the build up of lactic acid and also allows the body to perform for longer. Respiration Respiration is more efficient therefore the breathing rate is reduced. Effect on performance: The removal of waste products happens quicker and the athlete is able to recover from exercise quicker. Increase in Lung Size The lungs increase in size therefore they can take in a larger amount of oxygen. Effect on performance: As the athlete can take in more oxygen the body is able to work for longer without fatigue. Stronger Diaphragm The diaphragm becomes stronger therefore more oxygen can be taken in and carbon dioxide can be exhaled quicker. Effect on performance: As the diaphragm is more efficient the body can inhale and exhale quicker therefore the body can work for longer without fatigue. Increase in Tidal Volumes Tidal volume increases as the lungs are larger and can intake more oxygen. Effect on performance: As the athlete can take in more oxygen the body is able to work for longer without fatigue. Faster removal of Carbon Dioxide As the body can remove more carbon dioxide from the body there is less of a build up of waste products which cause fatigue. Effect on performance: As waste products can be removed quicker the athlete can work for longer without being affected by fatigue. Neuromuscular adaptations to endurance Increase in myoglobin capacity Doing an activity which puts more oxygen into the body means the body has to adapt to take on more oxygen. Effect on performance: The more oxygen the body can take on and store in the muscles means the performer can work for longer without fatigue. ...read more. Increase in Resting Heart Rate Effect on performance: The athlete is able to reach their maximum heart rate easier to achieve but as a result the athlete cannot work for the same amount of time as they used to. Effects of De-training on the neuromuscular system. Decrease in CP, Glycogen and ATP stores in muscles. Effect on performance: Less CP means that the muscles cannot create ATP fast enough for the body therefore less energy is made for the body to use. As there is less glycogen to create energy the lactic acid system is not as effective and in turn there is a lactic acid build up in the muscle which causes fatigue. As there is less ATP available for muscle contraction fewer muscular contractions occur and therefore fatigue sets in quicker. This affects the neuromuscular system. Muscle Atrophy Atrophy occurs in the muscles as they are not being used. This effects the neuromuscular system. Effect on performance: As the muscles aren't as strong or big as they were less power can be produced for muscle contraction. Recovery Time from Exercise The time it takes the athlete to recover from exercise is longer. Effect on performance: If the athlete takes longer to recover, the athlete will need more breaks therefore overall performance will decrease. Decrease in Haemoglobin numbers In the blood there is a decrease in the number of haemoglobin which means the amount of oxygen that can be transported is lower. This effects the cardiovascular system. Effect on performance: As there is less haemoglobin to transport oxygen to the working muscles, muscular contractions don't occur as fast therefore causing fatigue faster ?? ?? ?? ?? 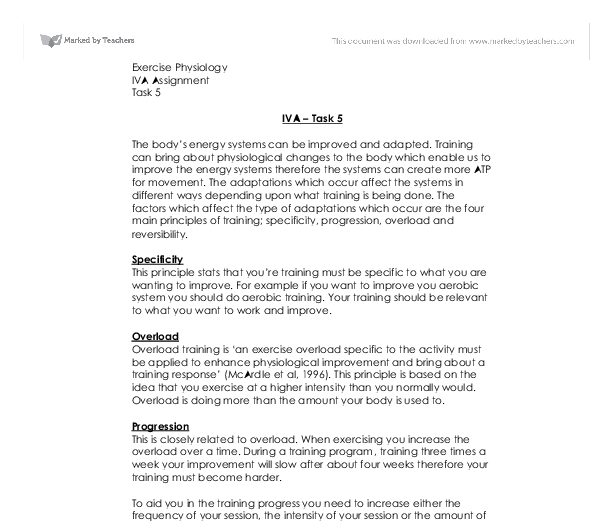 Exercise Physiology IVA Assignment Task 5 Vikki Keeping ...read more. Each exercise is performed for a specified number of repetitions or for a prescribed time period before moving on to the next exercise. The exercises within each circuit are separated by brief, timed rest intervals, and each circuit is separated by a longer rest period. in his tactics as it allowed Urango to get away from Ricky Hatton and break up the fight, this then is a definite area for Ricky Hatton to work on and develop in changing from one stance to another to fool his opponent and dominate the fight. potential, my heartbeat after exercising should be closer to 205 beats per minute. Though, it is even hard for athletes to reach their maximum heart rate or the maximum number of beats per minute that your heart is capable of beating. future performance * Indicate weaknesses * Measure improvement * Aid the evaluation of programmes * Motivate the athlete Fitness testing is essential for the sport as it is written proof that you are physically better via the use of normative data which is supplied for each major fitness test. * Gross error detection and correction is practised. 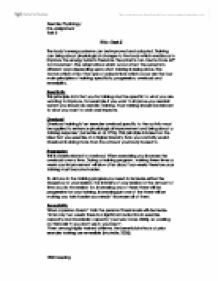 * The skills are practised and refined under a wide variety of conditions. All of these qualities are shown by the performer and, more importantly, consistency. The performer has competed for a club but never progressed any further. His training is very inconsistent; as he averages one training session every other week. 30 Muscular Endurance The NCF abdominal Curl Test --> Complete as many sit-ups as possible in 30 seconds. --> Come up 90o from your back. --> Arms remain on chest. 27 Flexibility Sit and Reach Test The measures for the flexibility of the hamstrings. The partner should take the leg being stretched and pull it up until it will go no further. From this point, the quadriceps contract-relax sequence or the quadriceps contract-relax with hamstring contract can occur. Shoulders: The stretcher should be kneeling on the floor with his back straight, facing away from the partner.